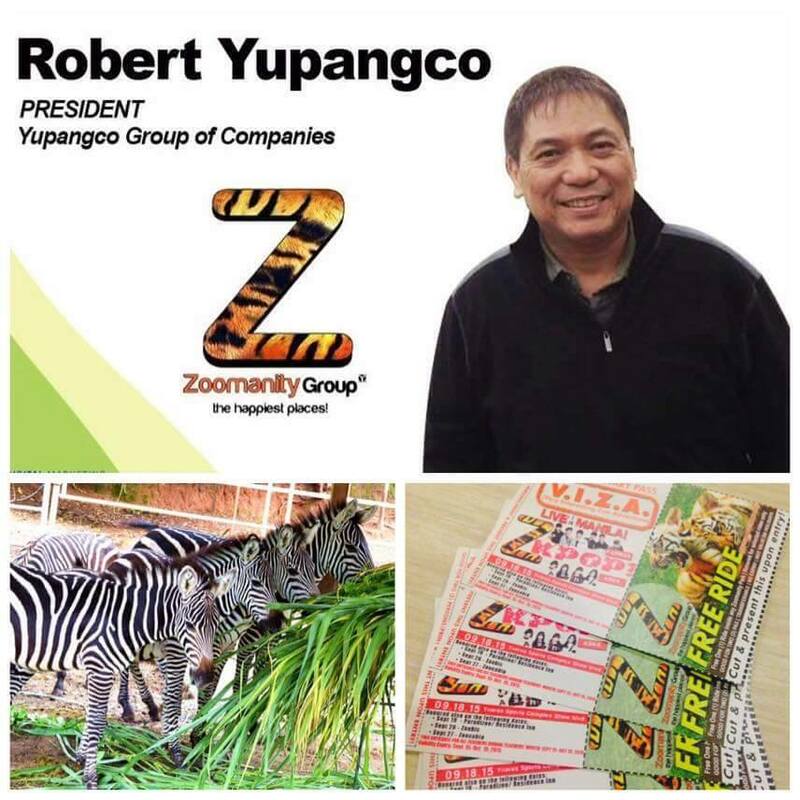 The visionary behind the success of different Zoo under Zoomanity Group and more than 30 businesses around the Philippines is no other than the grandson of our former President (Jose P. Laurel) and a nephew of our former vice president of the Philippines (Doy Laurel), Mr. Robert Laurel Yupangco of the Yupangco Group of Companies who handles the Zoomanity Group (Zoobic Safari at Subic, Zoocobia at Clark, Zoocolate Thrills at Bohol, Paradizoo at Mendez Cavite, Residence Inn at Tagaytay.) has a vision of one big green themed park in the Philippines and now with Zootopia in Japan. An environmentalist and a hands on entrepreneur, Sir Robert or RLY is the man who empowered his employees to think outside the box. He likes each of his zoos to improve more on its own with its unique identity. The vision does not stop with the present properties and businesses. From the current 6 zoos and 4 hotels, RLY is focus now to add more than 20 zoos in the near future and still scouting for 7 more locations to build different Japanese restaurants. He manage 3 Japanese restaurants; Nanten at Manila Polo Club, Misono at Jupiter Street, Bel Air and Ruins at Metropolitan, Chino Roces. All in Makati. Just recently, RLY launched a vacation and travel packages for those who likes to take advantage of the discounted rates of his hotels and those who have kids who likes to visit frequently the zoos. The Green package with Three different rates was presented with Php 250,000.00, 180,000.00 and 90,000.00 (As of the moment there's a promo with more discounted rates) choices for each package with unlimited access to Zoomanity themed parks, 40 to 420 room nights and a free customized tablet for each successful client. Benefits from this packages ranges from 200k to 1.4M and will surely be a hit to travelers and tourist because of the big chunk of benefits. For 2016, the Zoomanity group prepared 100 events and inviting everyone from Paradizoo at Mendez, Cavite to Zoocolate Thrills at Loboc, Bohol to enjoy different activities like Cable Car, Zip line, Horseback riding, photo ops with real tigers and white snakes among other things. Definitely a lot of reasons to visit Zoomanity Group Theme Parks with your family and friends! Good news to everyone, in celebration of the World Teacher's Day, Zoomanity Group is happy to announce that they are opening the doors of all its theme park in the Philippines for all teachers to honor them from September 15, 2015 till October 15, 2015. Just get the V.I.Z.A. coupons from TAG Media and Public Relations while supplies last. For travel and vacation packages just call or text 09166299381. TAG Media and Public Relations is the marketing and branding arm of Zoomanity Group. Call us for the Zoolit Coupon Booklet.